Until recently, our ministry was known as “Week of Guided Prayer” or “Month of Guided Prayer,” depending upon the length of the retreat. We decided to update our name for two reasons. First, some prospective retreatants are turned off by the misimpression that “guided prayer” equates to requiring a retreatant to pray in some particular manner or that the prayer guide may judge a retreatant’s prayer. By removing the word “Guided” and replacing the term “Prayer Guide” with “Spiritual Companion” we hope to clear up this misimpression. Second, our experience over these past twenty plus years is that grace happens during these retreats, both in ways that are familiar and ways that are surprising (we welcome the surprises from God with open arms!). Our experience also tells us that this grace is not always closely connected with a retreatant’s prayer times, but more with a retreatant’s desire to encounter God and God’s desire to be known. So in our retreats, there are moments of prayer and moments of grace. These moments may overlap, for instance during a retreatant’s personal prayer time on a particular day or during a time of prayer in a session with a spiritual companion, but these moments also may come to us in the midst of everyday life. For instance, while washing the dishes, sitting in traffic, walking with our dog, or during a dream. We believe that our fresh name more accurately describes what happens during our retreats and we welcome you to find out for yourself! 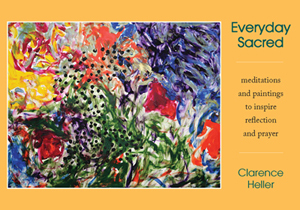 Connecting New is Clarence's monthly sharing of a poem, painting, prayer, and/or reflection with a spiritual message. Subscribe at ClarenceHeller.com.